White unriveted denim trousers. The fabric is supple and strong. 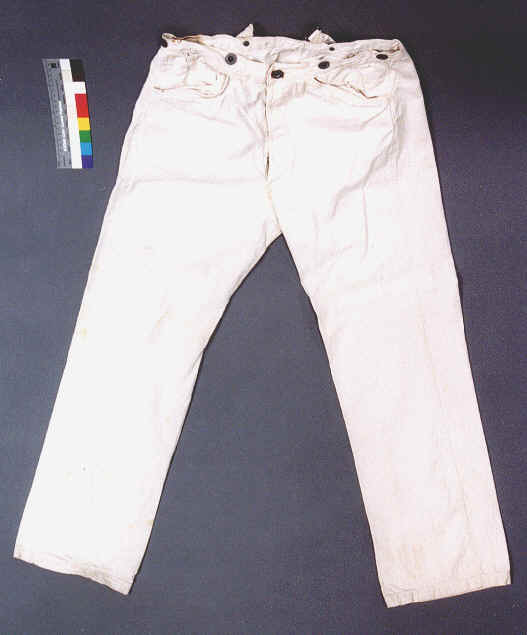 This pair was not bleached out to its present white color, but was manufactured this way. No belt loops or evidence of any belt loops. Suspender buttons are all present and measure .679 inches in diameter. 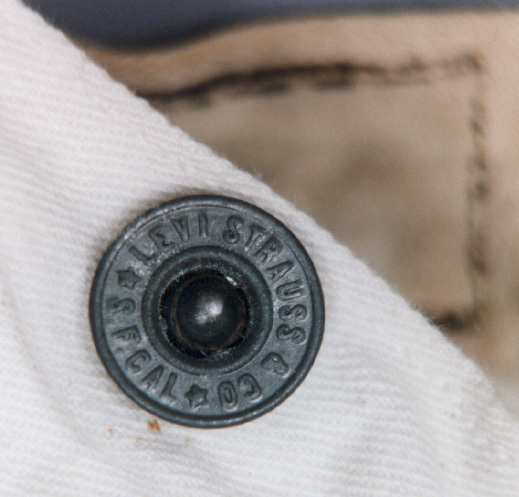 Buttons marked "LEVI STRAUSS & CO * S. F. Cal". 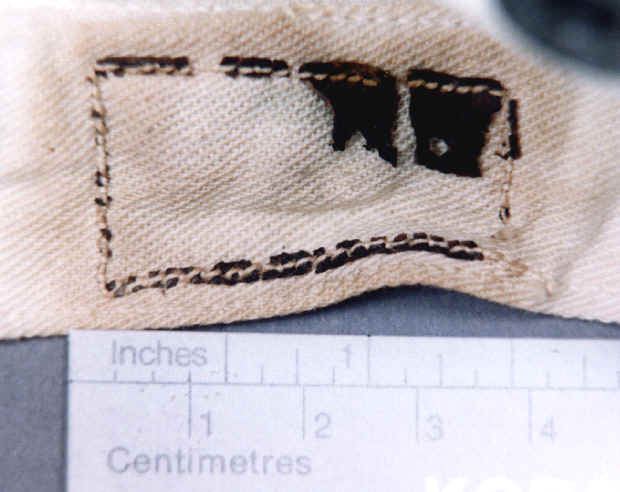 Remnants of leather label (nothing legible) sewn to the INTERIOR of the right rear waistband. Well... this pair of trousers is definitely a contender. Levi's are not my collecting specialty, but from what Lynn Downey at Levi's said, this style trouser was discontinued around 1917. That would make this pair that old at least. Levi's started sewing labels to the outsides of its trousers in the 1880's. The badly deteriorated leather label on this pair is sewn to the inside of the waistband rather than the outside. Thus, it may be that this pair predates the $46,700 pair that Levi's bought in 2003, which sports a label sewn to the outside of the waistband. 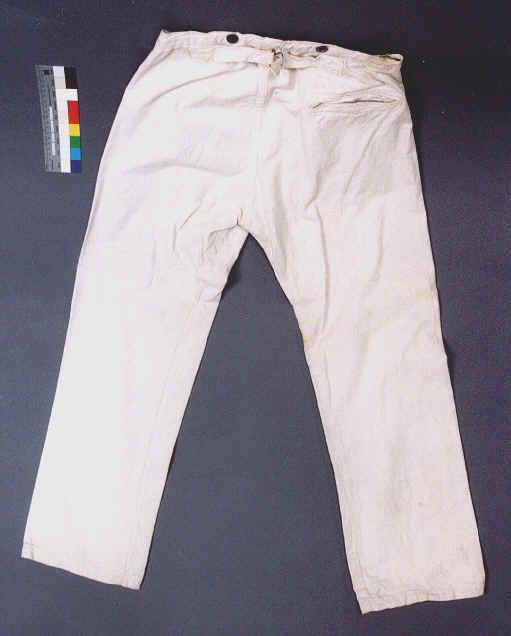 The provenance of these trousers is that they were the property of a U.S. Army cavalry musician. 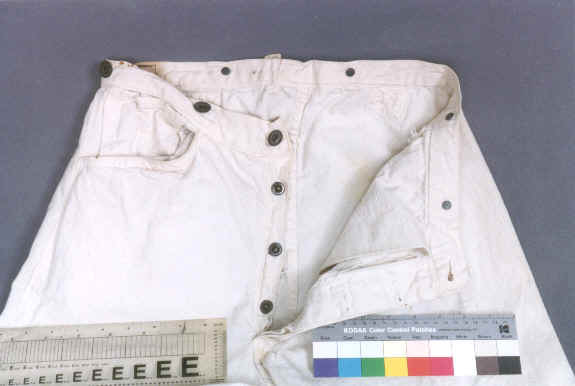 The pants accompanied a mint, unused summer white canvas U.S. Army tunic of the 1880-1900 era. Both pieces came out of the same military trunk. This article is in exceptional condition. Serious inquiries welcomed. Interior selvage edge of fabric in trouser legs has some limited fraying damage. Slight staining of the trousers in scattered locations. 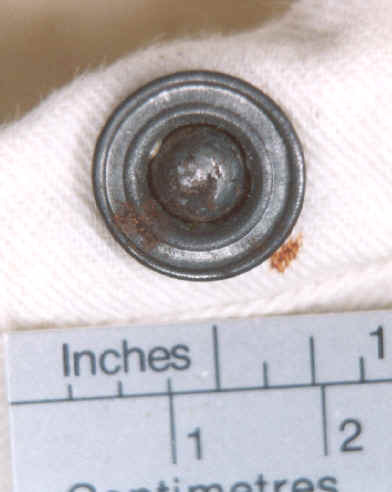 Some rust stains from buttons. One 1/4 inch hole in left front of waistband. The hole only penetrates the outside layer of waistband and does not continue through the inside layer (only hole noticed). Single hip pocket, located on the right side. Stitching to one side seam of the rear pocket has come out. Belted back. Adjusting buckle is intact with some rust. 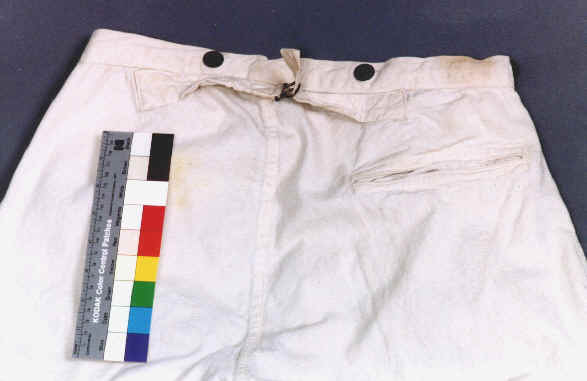 Single rear pocket on right. Button fly. Fly buttons .550 inches in diameter. Fly buttons not marked. Button holes are machine sewn. 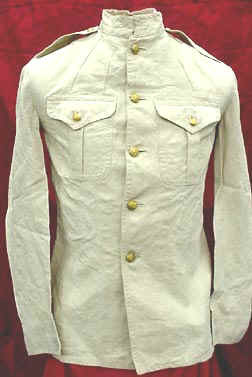 This is an example of the Marine Corps summer service tunic from the pre-WWI era. The pattern was short lived, in use from about 1899 to 1917, when the Corps abandoned the pattern. This example is in fine condition with two breast pockets, pointed cuffs and all buttons. There are no marks or tags in this garment. 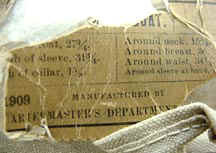 The illustrated paper tag is from a like tunic. There are two small repairs, one under each arm where someone made a lengthwise cut in the sleeve. The repairs are indiscernible when the garment is on display. Sold. Copyright © 2005 Eureka Arsenal. All rights reserved. Revised: January 22, 2012 .